The event was organised as an extension of the Bahraini Friendship Arabia Expedition, which involved a road trip from Bahrain to Greece in the summer. Mr Chrisogelos, who is the last traditional potter in Thassos, has a workshop on the beach and his main business is from tourists. "I was about eight when I first started with pottery," he said. "I used to go to school and come home and watch my father make pots, he taught me how to use the wheel and learn," he said. "My business started with my grandfather in 1908, but I am the last in my family to continue this tradition. 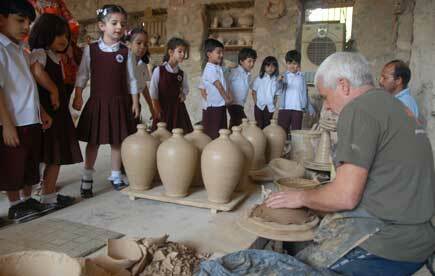 "I have two daughters and eight cousins, but they are not interested in pottery. 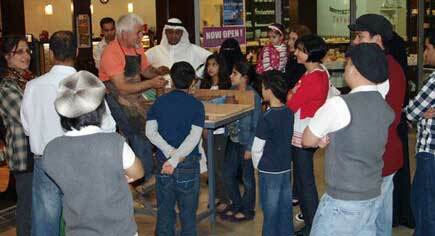 I am teaching people from the UK, Sweden and other countries who come to my workshop. "I feel if I don't teach my style and knowledge, then the history of the workshop will be lost." Mr Chrisogelos said it had been an interesting experience exchanging ideas with the Al Shouguls and other Bahraini potters, who had a slightly different approach to the craft. "Here it is a little different way to work with the pottery wheel and clay - here they make for decoration, but I make things to be used such as cups and bowls," he said. "I'm learning their way, for example, they use different ovens, they use gas and I use wood. "I have my own recipe for glaze that I have brought with me and I also brought 100 kgs of pottery from Thassos, so I can make items for people," he added. Pottery has been in the Al Shougul family for several generations and Jaffer Al Shougul, Majeed's father, learnt his trade from his father when he was just five years old. He is now happy to see his sons and grandsons continuing the tradition. "Costis is a respected guest and we are very happy he is here," said the 68-year-old. "I don't want this tradition to disappear, my father taught me and we have to teach it on." 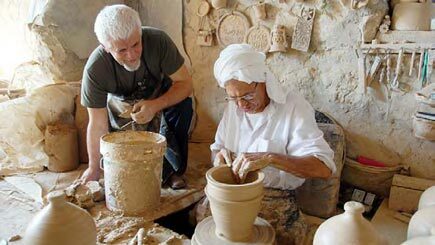 Mr Mushaima said he was planning another cultural exchange by taking a Bahraini potter from A'ali to Greece next summer.